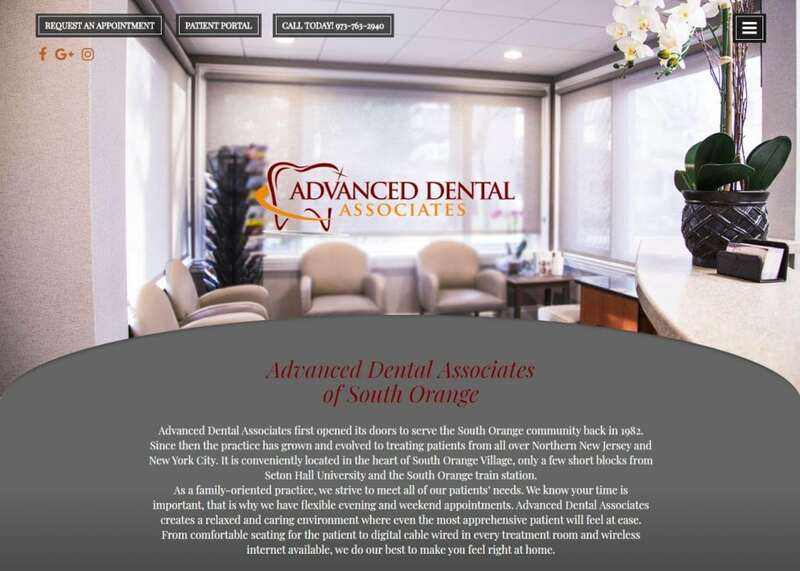 Servicing the South Orange community since 1982, the Advanced Dental Associates are known for their family-oriented practice and attention to detail. Focusing primarily on dental implants and cosmetic dentistry, the New Jersey natives wanted to design a website that would place the patient’s needs at the forefront of their mission. We welcomed the challenge of creating a website specifically dedicated to the patients. for this design, in particular, we went with a traditional site approach with lots of spacing. The home page is mainly comprised of a large image of the office along with a mission statement from the team. The majority of the information can be found through the unique hamburger menu on the top right-hand side. Underneath the mission statement, we rounded out the home page with some live testimonials and directions to the office. To complement the dentistry specialty, the dentists wished to integrate a red color scheme throughout the website. The use of red along the wide white spacing behind it creates a visual contrast that is pleasing to the eye. The red is primarily used to highlight a call to action. It is action oriented and pops out at the readers without coming off as too pushy or assertive. Combine the red with the cursive font seen throughout the site and you have the outline for sleek and fancy web design! The navigation hamburger menu is home to all the different services offered by the Advanced Dental Associates. There are many additional drop-down elements that expand when scrolled over. The square borders help establish a distinctive frame for the pictures and text. Both are equally spaced out and distinctive. The services tab features all the additional services that the dental office offers. When you click on the title of any of these services, you will be redirected towards a new web page. This web page describes the operation as well as answering a few of the most frequently asked questions surrounding the operation. The about us tab features a short summary of the dental team’s educational information and mission statement. As you move down the tab, you will notice a tab dedicated to promotions. This is a great way to attract new patients as well as giving your practice a boost in reputation. Being personable is key to establishing any new patient-to-dentist relationship. The top banner of the website is home to all the different marketing aspects that the New Jersey natives have to offer. There are links to request an appointment as well as widgets to their social media. There is even a patient portal for returning patients as well. With over 30 years in the industry, the dentists are more than capable of spreading their knowledge to those around them. They are no strangers to blogging and have incorporated several service articles and blogs on the hamburger menu. From the color theme to the professional images provided by the dentistry, the California natives are no new strangers to creating a powerful first impression. The smiling faces of the dental team are seen throughout the website, inviting new visitors to come give their dental office a try!